With the New Year brings our newly renovated free weight area! For those wanting to try something new, this workout is a great opportunity to challenge yourself and break free from your comfort-zone! This free weight circuit incorporates both barbells and free weights to give you the most ‘bang for your buck’ workout while getting you accustomed to the new area. Maximize your time in the gym with this circuit training workout! Why circuit training? A few of many benefits of full body circuit training include increased exercise endurance, time efficiency, builds muscular strength, improves body composition, and it’s fun and challenging! 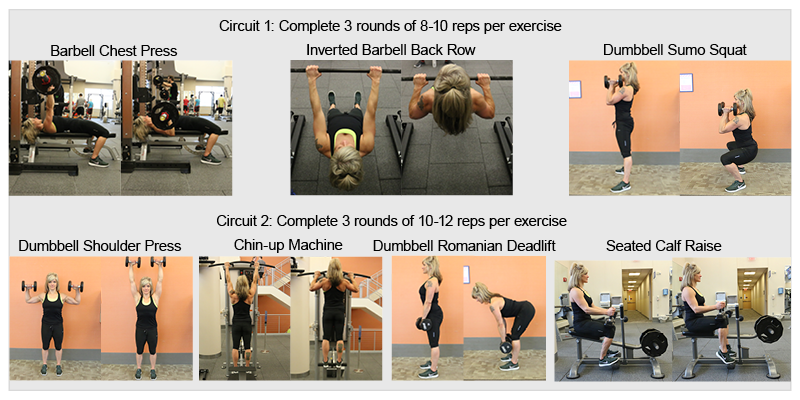 Complete all numbered exercises in a circuit-like fashion moving from one to the next with no rest between exercises. Once all 3-4 exercises are complete, rest 30 seconds, then repeat the circuit of exercises for two more rounds. Once you have completed "Circuit 1", move onto "Circuit 2" and complete the same way as Circuit 1. Challenge yourself and most importantly, have fun!